I’ve escaped my study and the corridors of academe for a few days, and have joined in an archaeological excavation beside the Monmouthshire and Brecon Canal at Ty Coch, near Cwmbran. It has been great to wield a mattock and have a trowel in my hand again after too long an absence from the trenches. 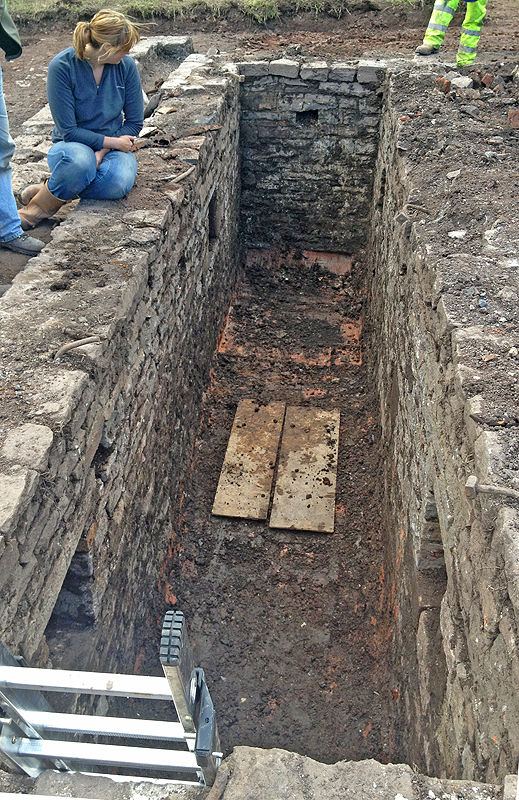 The site is beside Shop Lock, the top of a flight of three locks, and was discovered when a team of volunteers carrying out restoration discovered masonry just below the surface they were clearing. They called in an archaeologist and a local history group, and I heard about it also and couldn’t resist the temptation to abandon my studies and head to Wales. The pit and the building around it appears to have been contemporary with the construction of the canal (1790s) but to have been subsequently altered and repaired. At some point the building was demolished and the pit filled with rubble that contained material as varied as nineteenth century ceramics and a 1981 crisp packet. The location of a saw pit close to a series of locks is understandable given the need to fabricate, repair and replace lock gates. For me it’s been great fun. For one thing it’s been good not to be the oldest person on site! Good also to train a few volunteers in the finer skills of excavation and recording. It’s also a rare project these days that is almost completely volunteer-run. I’ve enjoyed finding a scatter of interesting nineteenth century material, and meeting some keen amateurs willing to brave the wind and rain of this miserable early summer! It’s not often I read a non-fiction book straight through, but I’ve just demolished my copy of Bill Brown’s 2003 A Sense of Things, The Object Matter of American Literature, which now sprouts a forest of page-markers. The book has given me lots to think about, lit some light-bulbs, sent me scurrying after other references, got me to download a couple of nineteenth century pdfs (ah the joys of technology…to be able to sit in one’s sick-bed, accessing 150-year-old volumes in US university libraries). I was already exploring Mark Twain’s writings about bric-a-brac, but Brown has alerted me to others, including Henry James, who has provided me with lots of interest. Brown points out that although some of James’ characters share a hatred of bric-a-brac, they also demonstrate that even “hideous objects could be loved.” As Brown writes: “…we use physical objects to arouse and organize our affection.” Yes! Now I’m several chapters into Things, which Brown edited in 2004. This of course is more of a dipping-into read, but still valuable. Weekend words. Who are we and when is now? I sat at the CHAT conference (see last post) listening and letting little bubbles of thought pop in my over-stimulated brain. You can’t take the archaeologist out of the process. The material world is changing minute by minute – how can archaeology deal with this? We are surveying the past in the present. Critical code studies (Ross Wilson) and the archaeology of the Internet. The archaeology of illicit and illegal activities (Gabriella Soto). When a discarded backpack might be evidence of a life/death struggle. Overburden (Craig Cessford). The importance of the surface. When people are highly suspicious of archaeologists (Suzanne Lilley) and when you might be damned for publishing! Agressive v “nice” roundabouts (Matt Edgeworth). Non-places, taken-for-granted things. The fascination of the familiar. Breaking rules (archaeological and societal). Exploring hinterlands by just “wandering about (Paul Graves-Brown). The importance of talking to people. Prague summer villas look as if constructed from children’s building blocks (Vaclav Matousek). The archaeology of “hopelessness” (Quintin Lewis) and the necessity of looking up (above the shopfronts) as well as down. The archaeological importance of friendly taxi-drivers! Archaeology as reportage (Rob Maxwell). The Archaeology of Occupy. Marjolin Kok and Elles Besselsen mull over the materiality of anti-materialists. Appropriating the mass-produced object (that is an important concept for me!) Making matter speak. The archaeology and transformation (and theft) of concrete slabs (Steven Leech and Ruth Colton). The end time and archaeology (Donnelly Hayde). Perhaps we won’t last long enough to finish our PhDs? Getting modern objects recognised as important by the powers-that-be. Why does the past end in 1700? (Hilary Orange). Turning one’s nose up at privies, and a potty on the mantelpiece (Paul Mullins). A discovery – the Czech “Tramping Movement”. Alberta, Manitoba, cowboys and potlach in the Czech forest. (Tomas Hirt and James Symonds). The sound of rust (Ron Wright). A high, a low and a jolt! The high: This morning I have the slightly swollen lips of a prize-fighter. However I’ve not been involved in any acts of violence – the very opposite. Yesterday, for five hours, I played first oboe in Manchester’s Cameo Orchestra as we rehearsed (for fun) Beethoven’s Fifth Symphony. Strangely, this was the first time I’d played this familar work, and it was great fun, despite a couple of minor lapses in concentration. I’ve always adhered to the musical principal that if you are going to play a wrong note, miss an entry or come in at the wrong place, one should do it with aplomb. Perhaps that is because playing the oboe, not a retiring instrument, means that everyone is going to hear whatever you do anyway. But the oboe can be hard work, hence my morning pout. The low: Because I’m now pretty-well based in Manchester I’ve had to give up my much-loved allotment at Whitemoor, in Nottingham. Last week I handed it over to Louise, who is taking it over. Although I’d only worked the allotment for some six years (one of my fellow gardeners has been cultivating his plot for 50 years), it nevertheless involved a lot of hard work, successes and failures, as well as, of course, providing plenty of wonderful organic produce, despite competition from ravenous hordes of slugs, snails, whitefly, aphids, wireworms and pigeons. The plot sprouted a hearty jungle of weeds as soon as my back was turned, and bricks and lumps of concrete turned up like dragons’ teeth, but it was great fun, great exercise, and being on the allotment, whatever the time of year or whatever the weather, was a restorative experience. I shall miss it a lot, and already look forward to growing food again in the future. The jolt: I learned this morning that a paper has just been published by a couple of authors well known to me that appears at first glance to preempt a significant chunk of my proposed PhD research. Hey, I’m just three weeks into my three years and someone is already chewing at my topic! I raced to download the paper, and gobbled up its 16 pages. It’s an interesting, well-researched and well-written paper, and yes, I found some overlaps, commonalities and challenges (it even cites my MA dissertation). But I also found a number of references and sources I hadn’t yet discovered (thank you), support for several of my ideas and approaches (phew!) and some very useful pointers. Still, it woke me up, this Monday morning! For me, the woman’s concern that her “bits of things” should be seen to best advantage is very revealing, and I believe supports my contention that even the poorest (these were people living in dark and dingy cellars and basements) wished to display some objects (a collection?) that reflected well on their owners. Hill, Octavia. Homes of the London Poor. Fortnightly Review, November 1866. Although I can see the point in discouraging difficult-to-read fonts from hefty documents, and I am as snooty about Comic Sans as the next person, the incident made me think about the relevance of a chunk of reconstituted cellulose splattered with carbon in this digital age. Today, need a thesis even be necessarily communicated via such an old-fashioned medium such as ink on paper? When I submitted my MA dissertation I had to courier three bound copies from Canada to England, which involved several days and not insignificant cost, while at the same time I emailed, in a few seconds, the same pdf file from which the copies had been printed to the department just in case the hard copy got lost. The cost of this latter process was, of course, negligible. But the same information could have been presented in other easily accessible and shareable ways, for example as a html file, easily searchable, with dynamic links to images and other resources that could have included video, and audio. 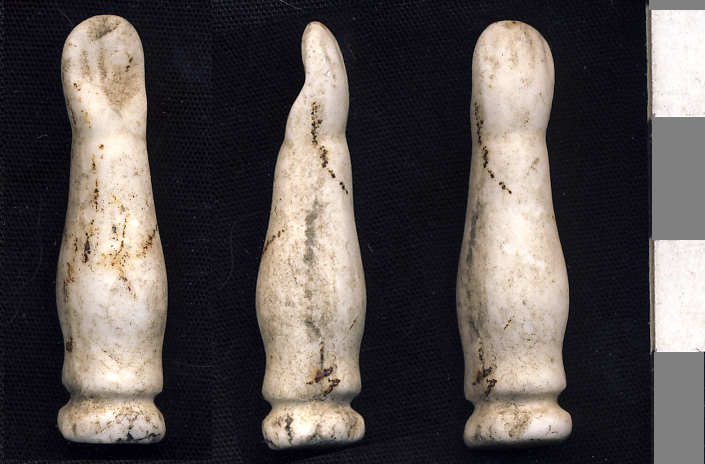 I could have included 360 degree images of the objects about which I was writing. But even this might not be ambitious enough. What about something that records the process of research from day one, and includes all the discussions, head scratchings, failures, successes, frustrations, triumphs, discoveries, mysteries, losses and findings that a research project involves? I get some of my best ideas/brainwaves,lightbulb moments whilst sitting in a noisy pub or during a hike. Those eureka moments are rarely recorded in published research. OK, an e-thesis might be difficult to “mark” in the traditional manner of course, but why should assessing something that has absorbed three years or so of someone’s life and which we hope will contribute to and enhance human knowledge, be easy? In addition, something as potentially dynamic as a digital thesis might also be accessed, read and used by many more people than the handful (if you are lucky) who will glance at the bound copy mouldering in the university archive. Hmmm, Plantagenet Cherokee sounds like a fun typeface!